Over seven seasons as music director of the Royal Scottish National Orchestra, Stéphane Denève helped to bring about what the media described as a ‘classical music revolution’ in Scotland. Journalists and reviewers have written about the incredible audience growth, widespread critical acclaim and tremendous feel-good factor that have all been characteristics of what has been dubbed ‘the Denève effect’. … it would be unfair not to acknowledge the phenomenal – and I do mean phenomenal – rapport that Deneve has built with this country’s audiences, who adore what he does and the musical results from his orchestra. I trust my own instinct: I think it’s been a fantastic appointment that has done no end of good for the RSNO and its stature. 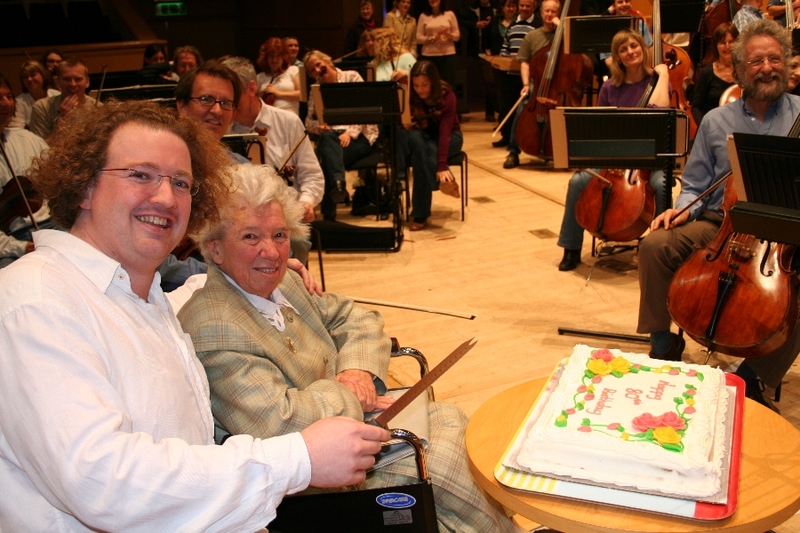 The so-called ‘Auld Alliance’ between Scotland and France was musically rekindled in October 2003, when Stéphane Denève made his Scottish debut, guest conducting a programme of Ravel’s Mother Goose, Prokofiev’s Violin Concerto No1 and Dvořák’s Symphony No8 (a particular favourite with Scottish audiences). Impressed and intrigued by this new presence on the podium, the RSNO immediately invited Denève back for the following season, in the meantime squeezing in a performance of Berlioz’s Symphonie fantastique during its summer Scottish Proms. Within two months the Royal Scottish National Orchestra had secured its man, and Stéphane Denève was appointed as Music Director from the 2005-06 season. The RSNO was formed in 1891 as the Scottish Orchestra and has had a long and proud history as Scotland’s national orchestra. Well-known names to have conducted the RSNO have included Felix Weingartner, Serge Koussevitzky and even the composer Richard Strauss. Denève followed in a long line of illustrious RSNO Principal Conductors including Georg Szell, Walter Süsskind, Sir John Barbirolli, Walter Weller and Neeme Järvi and was the orchestra’s first conductor to be given the ‘Music Director’ title since the late Sir Alexander Gibson. As national orchestra, the RSNO has a unique schedule of concerts. A typical week for Denève and the musicians might include a midweek concert in the north of the country (Aberdeen, Dundee or Inverness), a Friday evening at the Usher Hall in Edinburgh, and a Saturday evening performance at the Glasgow Royal Concert Hall. But that’s not all – since Denève’s arrival in Scotland he has participated in all aspects of the orchestra’s life, conducting children’s concerts in small venues across the towns and villages of the nation, recording sessions, rush-hour concerts, free lunchtime events, chamber concerts, new audience development projects and much more. Symbolic of his commitment to his new orchestra, and its huge range of activities, Stéphane Denève made the decision to leave France and make his home in Glasgow, Scotland’s largest city, with his then-girlfriend, Åsa. Thanks to the orchestra I feel that I can go for the music right away… they know me so well and know what I want. I’m extremely happy with the results … I adore making music with them. In the years that have followed, Stéphane Denève has taken the orchestra around Scotland and Europe, with annual performances at the Edinburgh International Festival and frequent appearances at the BBC Proms in London. He earned the orchestra its first invitation to the St Magnus Festival, Orkney and to the Festival Présences, Paris. 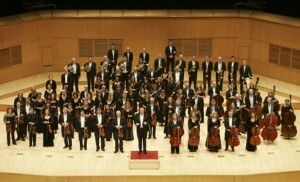 Denève and the RSNO have toured extensively in Europe, including in Spain (with Scottish violinist Nicola Benedetti) and across central Europe (with violinist Hilary Hahn). Venues have included the celebrated Vienna Konzerthaus, Munich’s Philharmonie am Gasteig and the Théâtre des Champs-Elysées in Paris. 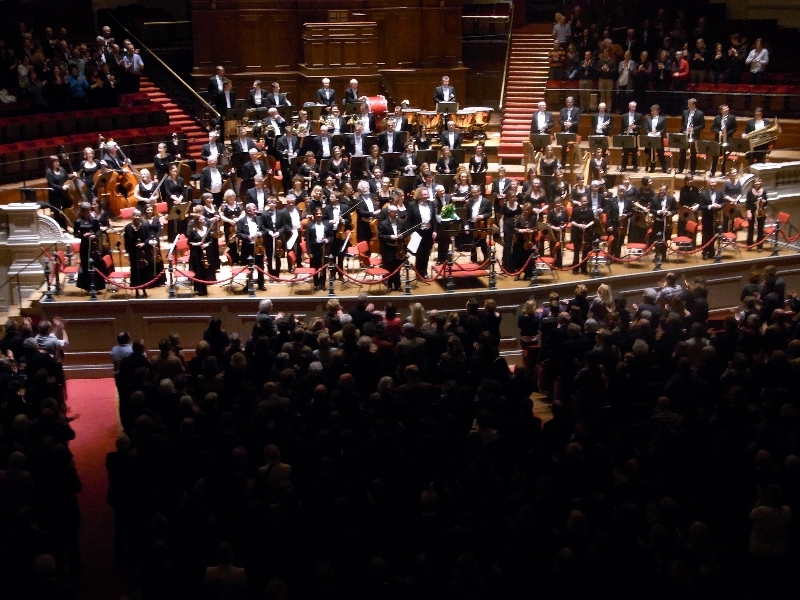 In January 2010 the RSNO made its debut in the Concertgebouw, Amsterdam, peforming Fauré’s Requiem. For this special performance, Denève and the orchestra were joined by the RSNO Chorus and Junior Chorus, and soloists Lisa Milne (soprano) and Christopher Maltman (baritone). The RSNO could not have wished for a better send-off to Amsterdam’s Concertgebouw, where it performed last night, than the packed house that turned out for the same all-French programme previewed in Edinburgh on Friday. Denève’s demand for spacious phrasing and tiny expressive detail brought an ethereal and pristine effortlessness. Stéphane Denève’s first week of concerts in September 2005 with the Royal Scottish National Orchestra took a programme featuring Ravel’s Suite No 2 from Daphnis et Chloé and Beethoven’s Symphony No 9 Choral to Aberdeen, Dundee, Edinburgh and Glasgow. The program began with a new work, commissioned by the RSNO, dedicated to Stéphane Denève, by French composer Guillaume Connesson. With these performances of Connesson’s Une lueur dans l’âge sombre (A Glimmer in the Age of Darkness), Denève introduced Scottish audiences to a new and relatively unknown composer whose music they would soon grow to love. It was not the first time, however, that Denève had championed the music of his fellow countryman, Connesson. Some years previously, Leonard Slatkin and the National Symphony Orchestra (Washington D.C.) asked Stéphane Denève to present a piece by a living French composer, suggesting a couple of familiar names. Denève had the idea to search out a brand new name, someone who would benefit from the publicity that a US première would garner. A huge response from French music publishers yielded nothing that grabbed Denève’s attention. And then Supernova arrived – a work by the 30-year old Paris-based composer Guillaume Connesson – a name unfamiliar to Denève. The concerts were a huge success with audiences, musicians and critics alike, and it marked the start of a hugely successful musical partnership – and friendship – between conductor and composer. The RSNO’s 2005 commission Une lueur dans l’âge sombre was written as a natural follow-up to Supernova. As Connesson explained, ‘I felt the need to compose a new score that counterbalanced the freed energies of Supernova. With Une lueur we find ourselves 400,000 years after the Big Bang’. 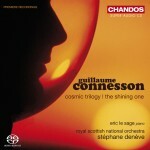 In Guillaume Connesson’s mind, these two symphonic poems would only be complete with a third piece, creating a three-part lyric symphony: The Cosmic Trilogy. 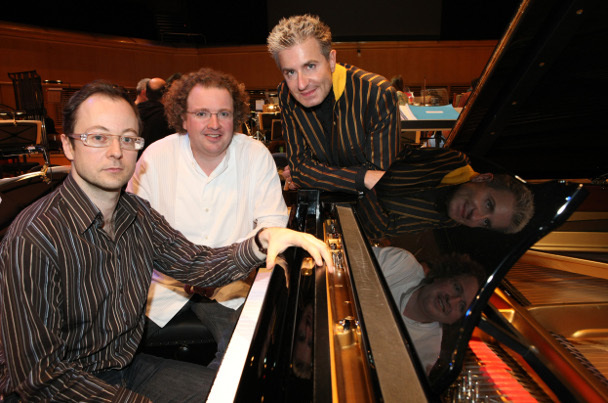 And so, the RSNO commissioned Aleph, in 2007, premiered by Stéphane Denève and the RSNO in September 2007, for the opening of the orchestra’s new 2007-08 season. The work was dedicated to Stéphane and Åsa Denève as a wedding present. 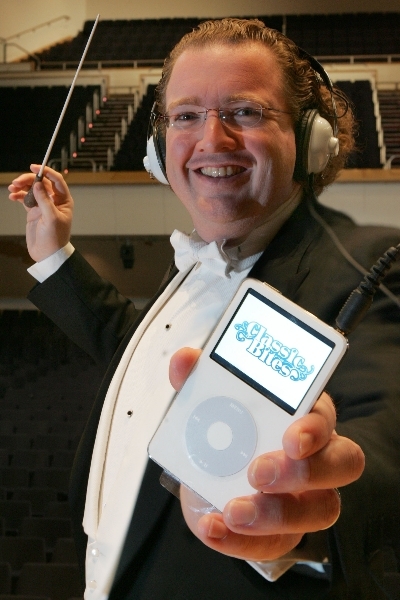 Since 2005, symphonic poems from the Cosmic Trilogy have been performed by the Philadelphia Orchestra, the Los Angeles Philharmonic, the BBC Symphony Orchestra, the Orchestre National de France, the Malaysian Philharmonic, the MDR Leipzig, the New World Symphony, and the orchestras of Toronto, Dallas, Cincinnati, Houston, St Louis and others. The Denève-RSNO-Connesson musical partnership reached a new height in 2009, with the commissioning of another new work from the composer, a Piano Concerto, entitled The Shining One. It was premièred by the orchestra and Denève in March 2009, at the RSNO’s Springtime in Paris Festival, with soloist Jean-Yves Thibaudet. The most virtuosic composition with the most incredible virtuosic piano playing we have ever heard. Incredible stuff. Very, very exciting. I have heard a few of his works now, thanks to Stephane, and have enjoyed all of them. This was no exception. Richness, vitality, rhythmic and forceful. Contrapuntal piano theme enforcing. A very complex work. I’m already a huge fan of Connesson thanks to Stephane and the RSNO. Some wonderful moments for brass and percussion. I particularly loved the opening. Jean-Yves is very lucky to have such a piece dedicated to him. Please record this! That audience member’s wish was in fulfilled in 2009, when Denève and the RSNO did record The Shining One and the Cosmic Trilogy. Click here for more details. Ten years after unearthing Connesson’s Supernova in a search for new music, Stéphane Denève launched another appeal. This time he sought not one but TEN orchestral works – ten pieces of music from the first decade of this century that would, in his opinion, ‘truly stand the test of time’. After consulting with colleagues, conductors, musicians, publishers and friends, Stéphane selected ten works and programmed them into the RSNO 2010-11 season, accompanied by an extensive promotional and audience engagement campaign. Stéphane recorded short videos for all ten of the pieces of music. You can watch them here. Very quickly a trust and loyalty was established between conductor and audience, which enabled Denève to take RSNO audiences on a musical journey, a journey that took in contemporary music (including Scotland’s James MacMillan, France’s Guillaume Connesson, Fabien Waksman and many others), less familiar French repertoire (Roussel, Poulenc, Dukas, Schmitt) and major projects such as Berlioz’s La Damnation de Faust, Grieg’s Complete Incidental Music to Peer Gynt and so on. It is testament to Stéphane Denève’s ability to connect with audiences, not only through the music but also through programme notes and personal on-stage introductions laced with Gallic humour and charm, that audiences grew dramatically in size through this period. Whether it has been ‘rush-hour’ concerts at 6pm to attract shoppers and commuters, or a new series designed to introduce newcomers to orchestral masterworks (Naked Classics), Denève and the RSNO have never been afraid of experimenting with traditional formats. With Classic Bites, Stéphane introduced potential audiences to highlights from the concert season in short, digestible movements. During 2009’s Springtime in Paris festival, Denève used video, presentations and staging to enhance the musical experience. 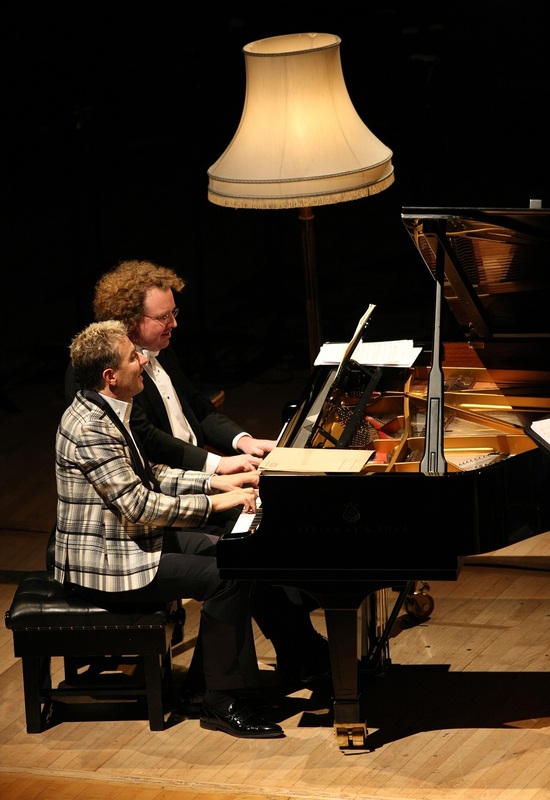 He even went as far as to re-create the Paris salon of the 19th Century, joining Jean-Yves Thibaudet at the keyboard to peform a series of French piano duets. For sheer entertainment value, with wall to wall music of idiosyncrasy, quirkiness, wackiness, sophistication and lashings of style that could only have been French, Stephane Deneve’s first large-scale concert in his six-part exploration of Parisian culture captured the imagination and, clearly, the spirit of the large audience. There has never been a concert like this one! The RSNO’s statistics prove what is obvious to anyone attending an RSNO concert: During Stéphane Denève’s time with the RSNO audience numbers have increased year-on-year, with subscriptions in Glasgow doubling, and even trebling in Edinburgh. In addition, over 3,000 under 26-year-olds are now regular attendees and thousands of under-16s hear the orchestra every year through free ticket schemes and concerts for schools and families. 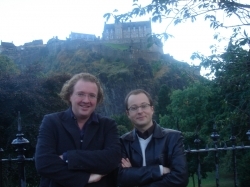 Stéphane Denève’s contribution to Scottish musical life has not gone unrecognised. He is an official music ambassador for Glasgow (alongside the composer Craig Armstrong, comedian and musician Billy Connolly and rock musician Alex Kapranos). Stéphane Denève has devoted much of his conducting career to promoting and celebrating the music of his countryman, Albert Roussel. With the RSNO he has conducted one of Roussel’s symphonies or ballet works in every season and the partnership recently completed the final volume of their acclaimed five CD survey of Roussel’s orchestral works. …the names of Stéphane Denève and Albert Roussel have become inextricably linked…. Indeed their paths crossed, figuratively speaking, at the very outset of Denève’s road to stardom (one of the first pieces he ever conducted was by Roussel). Denève even studied at the Conservatoire in the northern French city of Tourcoing – the city of Roussel’s birth. Roussel was a very big figure in Tourcoing, where I too was born and grew up, and some of the very first pieces I worked on as a young trainee conductor were by him. And I took to his music at once. To this day, I totally identify with it, and with its particular character. Part of this is geographical. Tourcoing is very near the Flemish border, the borderline between Flanders and Wallonie. Look northwards and you find a more Protestant world, of great seriousness, often very organised, a little bit sentimental, a rather understated style of humour, sometimes a bit austere, a bit mathematical. Look southwards and you have the Latin, Gallic, more southern style of France: more colourful, more full-blooded and direct, more outspoken, quick and enlivened by fantasy—you know, these kind of more Latin qualities. Tourcoing combines them both. As does Roussel. C’est la vie, time flies and seven seasons with the RSNO and with you have passed by so quickly…Trying to summarise so many concerts, so many emotions, so many musical adventures, so many friendships, makes me speechless – which is very rare, as you know! Merci to the music for bringing people together, inspiring us, helping and enriching our lives. Merci to all the musicians, the singers of our choruses, the staff, present and past, of our wonderful RSNO for their talent, dedication, warmth and above all their passion for music. Merci to each of YOU individually, our loyal RSNO audience, for sharing your love of music, for your enthusiasm, your applause and your encouragement. Merci to all our active supporters, the Circle members and donors, and our corporate partners, for their continuous help, energy and generosity. Merci to all the RSNO Board members, to our First Minister, Culture Minister, Lord Provost, and various executives and cultural institution directors for their support, for sharing our visions and allowing our dreams to happen. Merci to the teams at each concert hall, for helping to make every concert special. Merci to my dear wife Åsa and our Scottish daughter Alma for making me a proud father and husband, for offering me a life that I never thought could be so rich and joyful. Merci to the Scottish weather for helping me study my scores at home indoors! Stéphane Denève has excited us and entertained us. Over his seven years as the RSNO’s Music Director he has made a massive contribution to the quality of musical life in Scotland. A magisterial Stéphane Denève has presided over wonderful concerts with the RSNO, but what will perhaps give us our warmest memory of Stéphane, is the relationship he has created with our audiences. Stéphane’s inimitable addresses from the conductor’s podium have enhanced our understanding of what is about to be performed, demystified what might otherwise be a daunting programme, and have engaged orchestra and audience in an intense shared enjoyment. Stéphane, Scotland’s cultural health has benefited hugely from your time with the RSNO. We wish you well for what we know will be an ever more distinguished career wherever that takes you in international concert halls. But please remember Scotland and the RSNO, and our role in helping to establish your international presence. The Auld Alliance with France is alive and well. You have embodied it and given it fresh meaning. Come back to visit us! “Au revoir” means exactly that! I am in awe of the commitment, effort and passion Stéphane Denève has invested in the RSNO throughout his tenure. His love of music and dedication to exploring the inner depths of the pieces he conducts – not to mention his charming way of welcoming us to concerts – have made the concert experience all the more enjoyable. And his period as our Music Director will be remembered as one of the golden periods of the RSNO’s history. The Orchestra is in a much stronger position than it was seven years ago, and a very large part of that success is thanks to Stéphane. He has striven to develop the Orchestra and to find a new home of the quality to do so. Thanks to his determination, and the exceptional talent and professionalism of our musicians and staff, we will have a new home by 2014 and have a strong platform from which to realise new ambitions. Tonight we celebrate the man who helped make this possible. Thank you and bravo, Stéphane. I would also like to take this opportunity to wish you, Åsa and Alma, all the best for the future. Stéphane Denève’s contribution to the RSNO and to enriching the cultural life of our nation has been immense. I have been privileged to have seen and heard Stéphane perform with the RSNO on a number of occasions, and have been deeply moved by the professionalism, passion, energy and exuberance displayed by this partnership. 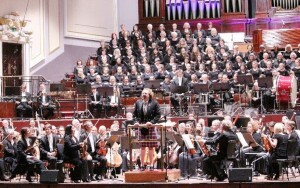 His unique blend of superb conducting skills, ability to connect with audiences and sheer charm have enhanced the strong reputation of Scotland’s national symphony orchestra. We thank him for his commitment, wish him well, and look forward to welcoming him back to Scotland in the future. Since you arrived in Scotland in 2005, French music could hardly have dreamt of a more inspired ambassador. Young, passionate and French, you transmitted your energy and love of music – and of our national composers – to your musicians and all the music lovers around Scotland. Beside your very wide repertoire, ranging from Mozart to Adams, your programmes showed great respect for our romantic Hector Berlioz or the impressionists Claude Debussy and – my personal favourite – Maurice Ravel, or Paul Dukas, Camille Saint-Saëns, César Franck, Albert Roussel or Guillaume Connesson. But you wouldn’t have given these treasures away to an audience you did not love too. You embraced Scotland at once, and Glasgow where you settled with your wife Åsa. You participated enthusiastically in all aspects of the RSNO’s life, conducting recording sessions, rush-hour concerts, free lunchtime events, new audience development projects and much more. You sealed an “Auld musical Alliance” so successfully that it was applauded in the most prestigious venues, including the Vienna Konzerthaus, Munich’s Gasteig, the Théâtre des Champs-Élysées and the BBC Proms in London. Based on these twinned passions, who could doubt your future successes in Stuttgart and further on? Bonne chance, Stéphane! 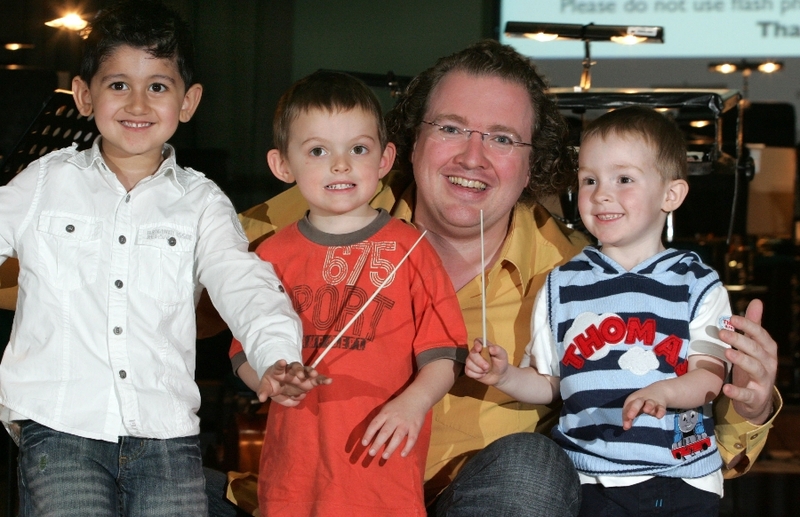 Stéphane quite simply transformed the RSNO’s fortunes in his seven-year Music Director tenure. 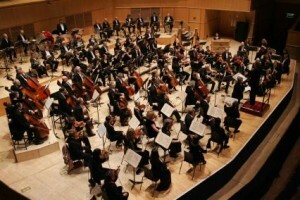 In an unusually fruitful and genuine partnership with former Chief Executive Simon Woods, the Orchestra’s audiences grew, finances revived from a troubling low and the band’s reputation for creating great music spread worldwide. Stéphane wowed audiences and sponsors alike with his sparkling musicality and his trademark chats from the podium in charmingly accented English. Highlights included standing ovations for the RSNO under his baton in the great concert halls of Europe, packed audiences at the Royal Albert Hall and above all, the affection and appreciation of his increasing and loyal audiences here at home. His and his family’s warm embrace of Scotland and all things Scottish endeared him to the nation. We owe him a huge debt. It was a privilege to work with him and I wish him and his family the very best for the future. Dear Stéphane, My six very happy years as Chief Executive of the Royal Scottish National Orchestra will always be inextricably linked in my mind with your tenure as Music Director. From the moment we first met in a restaurant in Washington D.C. in early 2005, I knew that this would be a wonderful professional partnership and a great friendship, and indeed it proved to be. It would take a whole book to chart the great times we had together in Scotland. But in just a few words, I would like to say a big thank you: thank you for your passion, your integrity, your conviction, your perseverance, your warmth, your generosity, your humour, your deep love of music, and above all, your friendship. These were great times, and they are never to be forgotten. Scotland is richer for you, and so am I. May the future bring you great satisfaction and joy, in Stuttgart and beyond. The RSNO is an internationally-admired orchestra with a long history of professional concerts and successful recordings. It is an honour for us to be Leaders of this great orchestra and it has been a privilege to work under Stéphane Denève. There can be no doubt that Stéphane’s leadership and charisma have been a significant factor in continuing and developing the great reputation that the RSNO enjoys. His love of new music, passion for the works of his native country and respect for the “classics” are all vital ingredients in what makes Stéphane such a spirited Music Director. On behalf of the Orchestra we would like to thank Stéphane for his passion and dedication and we wish him all the best for the future in what is sure to be a long and successful career. A Message from the RSNO Circle On behalf of the members of the RSNO Circle, we would like to thank Stéphane for all the wonderful memories we will have of his tenure. During the last seven years, we have enjoyed welcoming him across Scotland, thrilled that he has embraced our fair land as his home. We first got to know Stéphane at a special Circle event at Perth Concert Hall for the Mahler Symphony No1 concert in October 2005. Since then his charismatic flair, strong character and welcoming “good evening” have brought us closer to our orchestra and musically opened many new doors. We have also had the wonderful opportunity to travel on tour with Stéphane and the RSNO. There have been visits to the BBC Proms in London, and to Madrid and Paris. Always exciting and never dull, these trips will remain special memories for everyone who joined them. Stéphane, thank you for seven wonderful years of music with our orchestra. We wish you and your family a fond farewell and very best wishes for the future.